Tech entrepreneur Ray Chan has built a successful business out of wasting people's time. The Hong Kong businessman is the founder of 9GAG, a hugely popular online platform for sharing humorous GIFs, memes and videos. "We basically wanted to solve our own problem -- that was, how can we find funny pictures? How can I share them with my friends?" Chan told CNNMoney. In 2008, he and four partners, all of them in their 20s, pulled together $1,270 to start 9GAG as a side project to their day jobs. They had no idea that in less than a decade they'd be running a global entertainment giant. Today, 9GAG is one of the most popular platforms on the internet, drawing 150 million users a month, according to Chan. Its Facebook page has 39 million likes, and its Instagram account has 44.5 million followers. When Chan founded 9GAG, he was working as a project manager at an online community for book lovers and experimenting with other ideas in his spare time. "I thought the internet was a good platform for me to try out different things," he said. Initially, Chan and his co-founders only shared 9GAG among their friends, but traffic gradually started arriving from beyond their circle. At the same time, social networks such as Facebook (FB) and Twitter (TWTR) were taking off, and users began sharing content they'd found on 9GAG on those platforms. Chan and his colleagues were constantly working to adapt. "It took a long time for us to figure out what our users really like and what we really had to do to improve our product," he said. On 9GAG, users can upload their own photos and videos to the site and search for what's trending. The most prominently displayed content is determined by a combination of users' ratings and an algorithm. Social media posts are curated by 9GAG's seven editors. Chan says that there was "no specific moment" when the site suddenly got big. But by 2012, it was clearly no longer a side project. Chan and the four other founders quit their jobs to work on it full time -- and to figure out how it could make money. 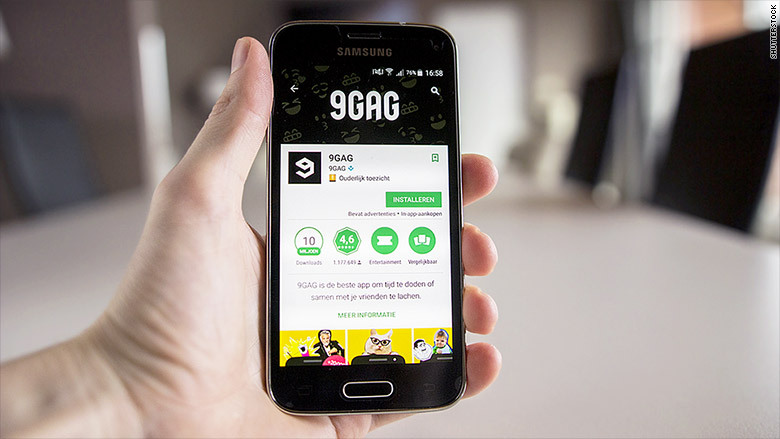 That year, 9GAG launched iOS and Android apps and its official social media accounts. It also began running ads on the site, which have become its biggest source of revenue. The team also flew to Silicon Valley and raised $2.8 million in funding from 22 investors. 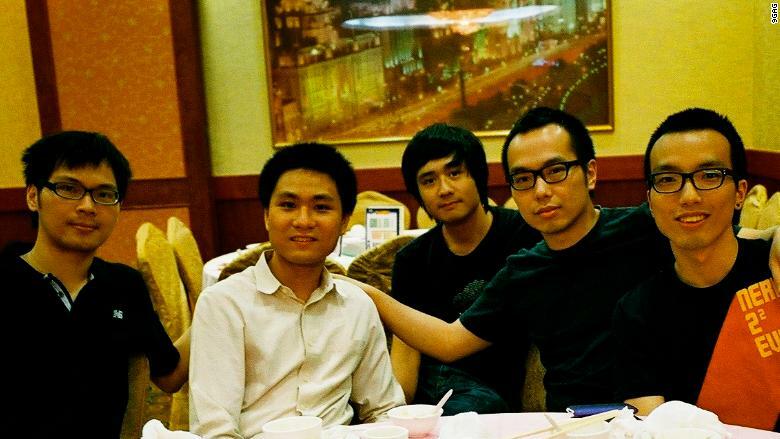 9GAG's founders, from left to right: Marco Fung, Derek Chan, Brian Yu, Ray Chan and Chris Chan. In 2013, 9GAG hired its first employee. 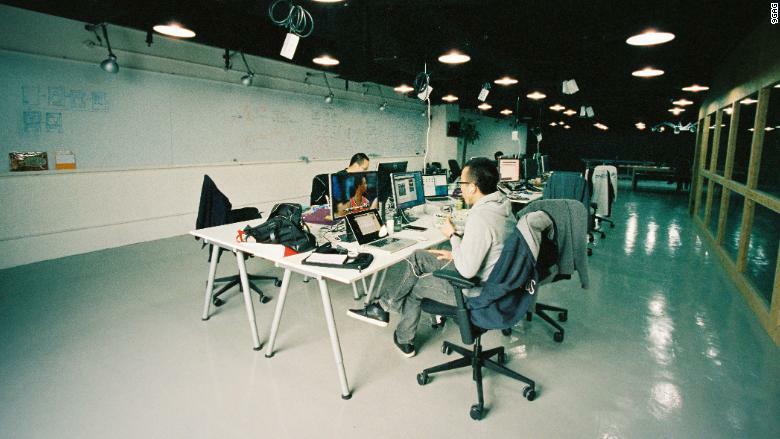 Today, the company has about 30 employees in Hong Kong and New York. The platform's biggest group of users is 18- to 24-year-olds, according to Chan, and most of its traffic comes from the United States. Its competitors are "anything that can help people have fun and kill time," he said. BuzzFeed, another site that publishes user-generated content, has about 154 million unique visits per month. 9GAG has also been compared to Reddit, particularly for its "upvote" or "downvote" system of rating posts. While there is always "new and popular" content on 9GAG, Chan said one recent item that stands out for him is an optical illusion featuring a cat. The user either sees the animal ascending or descending a set of stairs. The post has nearly 1,800 comments. Chan said that he spent a lot of time discussing it with his friends and that "our conclusion was: 'We really have too much time.'"